← Rock climbing this summer – maybe when the sun comes out? Primrose Bay – Hopeman – Still very wet but great between the showers and thunder! Stephen was over from Fortwilliam trying to get away from the midges and the rain. He hope the sunny East would be great, he arrived in a thunder and lightning storm and when it cleared we went down to Cove Bay or Primrose Bay near Hopeman. 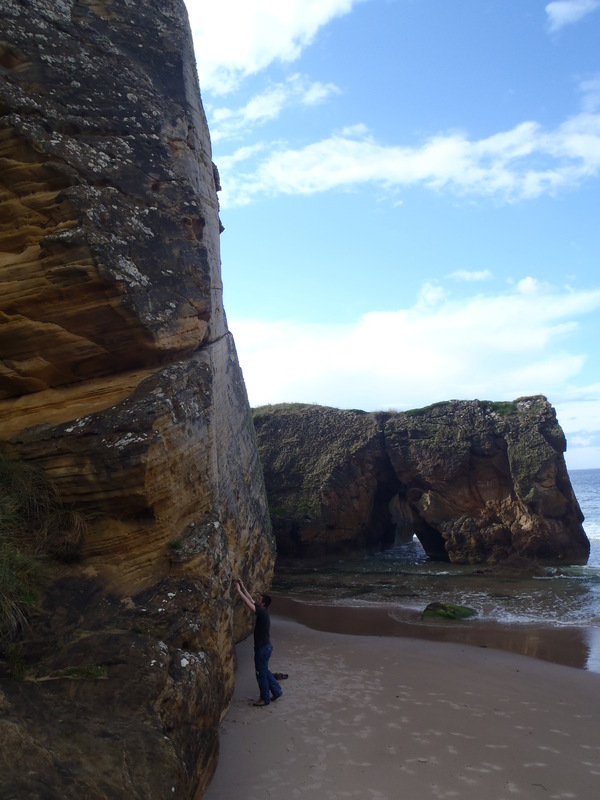 Stephen played and climbed here as a wee boy, where the caves and cliffs were his playground. He now see this great place with a climbers eye and we had a grand 2 hours bouldering on the wet sandstone with no one about. Again it is great to have such a place on the doorstep just a bit away from the crowds at Cummingston. 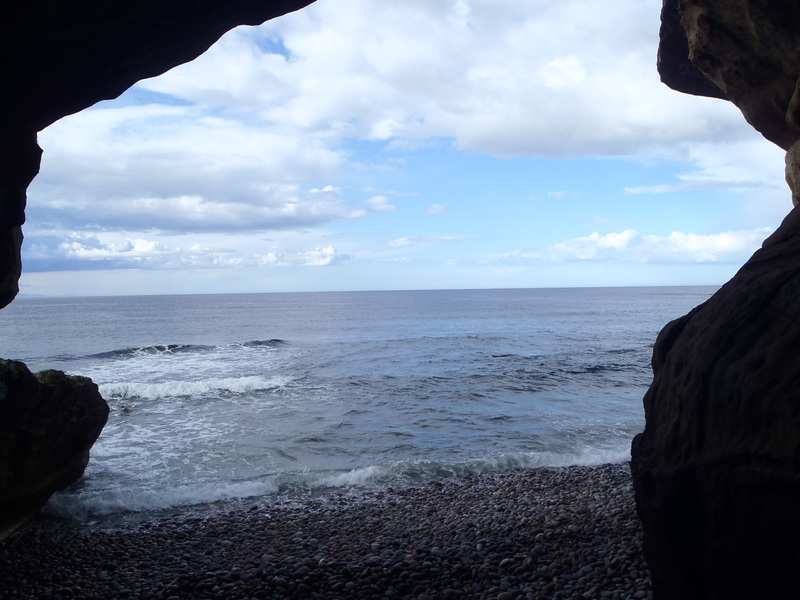 We never saw any Dolphins and sat in the cave between the showers listening to the noise of the stones speaking in in going tide. It is a grand place to be in a wild day with the waves crashing off the cliffs, outstanding views across to the Moray Firth in the distance. Yesterday there was an oil rig being towed across the Firth heading out to sea by a small tug, the Moray Firth is a busy place to be. The Singing Cave – Primrose Bay – what secrets have happened here in the past? We are off to have a look at Moy crag just outside Inverness today. Hopefully it will stay dry and be midge free,no matter what we will have some fun. It is an unusual cliff fitted with bolts for protection, Stephen is looking forward to it. 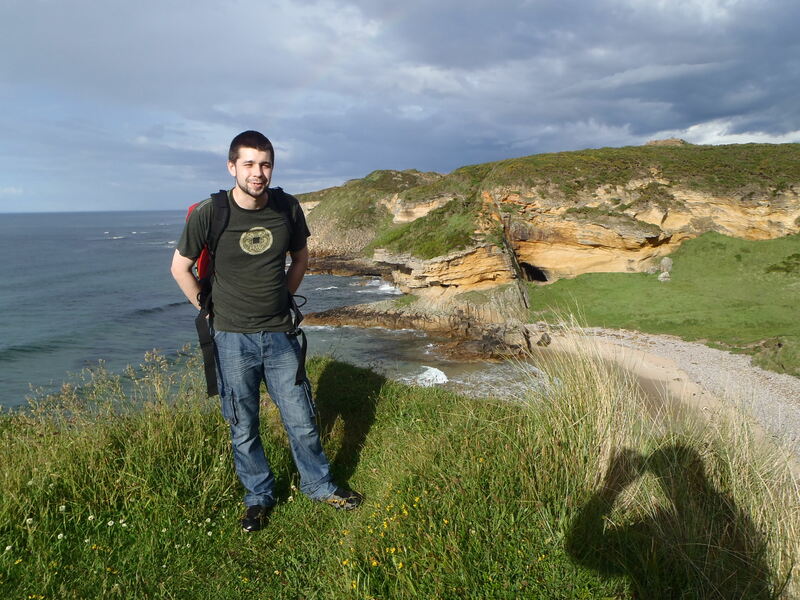 The Moray Coastal Walk – Cove Bay or Primrose Bay in the sun, a Moray gem. Just outside Hopeman one of the great places on the East Coast. This is a great place to spot wild life, with plenty of sea birds and of course the famous Moray Dolphins, with a pair of binoculars you can see a different world just a wee bit from the Moray Coastal path. Be aware that the cliff tops are pretty steep and in places the sandstone eroded its along way to the beach, be careful. This entry was posted in Enviroment, Friends, Rock Climbing, Wildlife. Bookmark the permalink.